Artist Andi Arnovitz has been appointed to Bezalel Academy of Arts & Design’s Board of Governors. A Mother's Early Morning Prayer." Her Kansas City JCC "Tender Shreds" exhibition has been sold out. Read reviews in the Huffington Post and Kansas City Star. 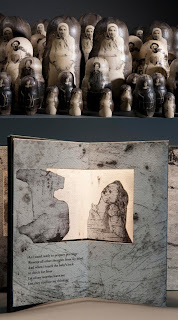 At MOBIA, New York, her work can be seen in “As Subject and Object”. This exhibit features contemporary artists riffing on traditional Jewish texts. Closes September 29.